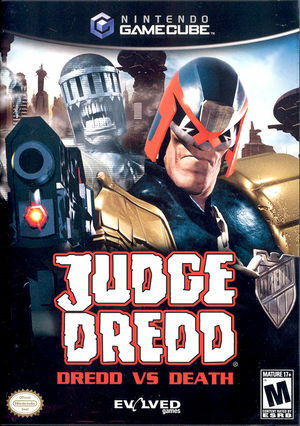 Judge Dredd: Dredd vs. Death combines weapon management, fast-paced combat, and intense multiplayer action. Based on the comic book, the game puts you in the shoes of Judge Dredd, a no-holds-barred judge who is determined to clean up the streets of the futuristic Mega-City One. Armed with an all-purpose LawGiver that features six types of ammo, you can shoot to wound, shoot to kill, or make an arrest--all while keeping an eye on your Lawmeter. Shoot an unarmed citizen, and your Lawmeter will drop; apprehend numerous criminals, and it will rise. Judge Dredd: Dredd vs. Death has a native 16:9 display option, but it requires enabling it in its internal options and setting Dolphin's Aspect Ratio graphics setting to "Auto". Using the widescreen hack with this title is not recommended. Cutscenes will not display at all, even when using Software renderer. Only audio will play correctly, although subtitles will display if they are enabled. The graph below charts the compatibility with Judge Dredd: Dredd vs. Death since Dolphin's 2.0 release, listing revisions only where a compatibility change occurred. This page was last edited on 28 March 2018, at 18:02.